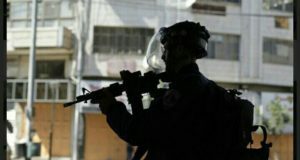 On Tuesday afternoon, February 23, 2010, Israeli soldiers arrested a Palestinian shepherd, Khalil Ibrahim Abu Jundiyye, from the village of Tuba. Abu Jundiyye, 19, was grazing his flock near Tuba when four Israeli soldiers, coming from the nearby Ma’on settlement, chased him and another shepherd back to Tuba. The soldiers aggressively pursued the two shepherds while Tuba families attempted to keep the soldiers away from them. 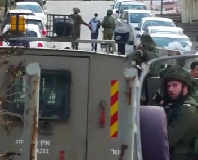 One soldier head-butted a Palestinian youth who was pleading for an explanation why his brother was being arrested. Another soldier loaded his rifle and pointed it in the air, threatening to shoot, forcing the families to quell their protest. Handcuffing him, the soldiers quickly led Abu Jundiyye away, threatening arrest for anyone who followed. Two members of Christian Peacemaker Teams (CPT), standing at a distance, saw that the soldiers forced Abu Jundiyye to walk blindfolded over rugged terrain for nearly one kilometer. 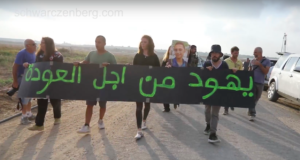 An Israeli human rights organization later reported that Abu Jundiyye was taken to the Beit Yatir checkpoint near the southern edge of the Green Line, adjacent to the Mezadot Yehuda settlement. Abu Jundiyye remained in custody overnight, but his whereabouts are unknown. According to the Israeli District Coordinating Office, Abu Jundiyye was presumably arrested for assaulting an Israeli soldier. The two CPT members present during the incident did not witness Abu Jundiyye assault a soldier. Nor is that charge supported by any of their video footage of the incident. Note: According to the Geneva Conventions, the International Court of Justice in the Hague, and numerous United Nations resolutions, all Israeli settlements in the Occupied Palestinian Territories (OPT) are illegal. Most settlement outposts are considered illegal under Israeli law.